Today’s “Card of the Day” features the G Guardian for Chronojet! 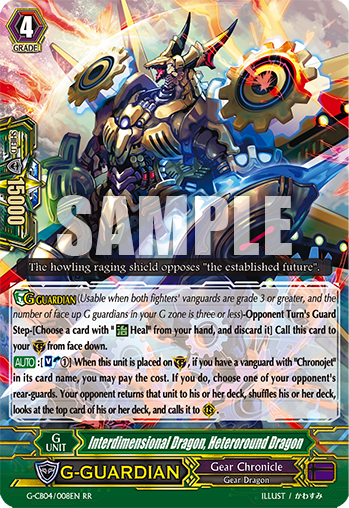 [AUTO]:[Soul-Blast 1] When this unit is placed on (GC), if you have a vanguard with “Chronojet” in its card name, you may pay the cost. If you do, choose one of your opponent’s rear-guards. Your opponent returns that unit to his or her deck, shuffles his or her deck, looks at the top card of his or her deck, and calls it to (RC).